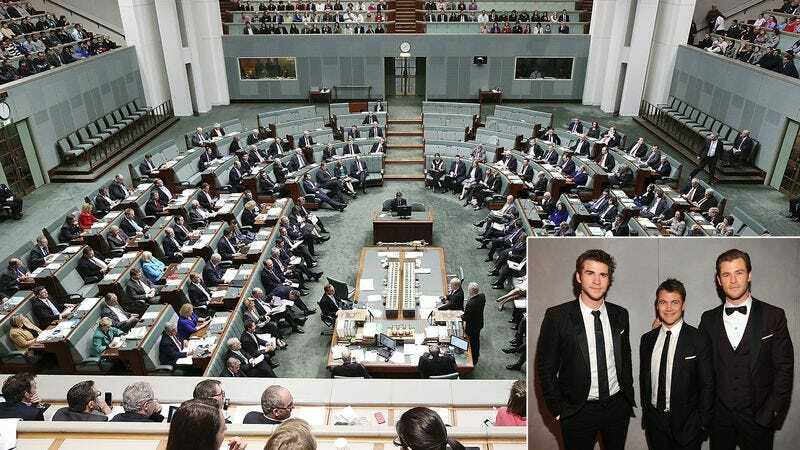 CANBERRA, AUSTRALIA—Stressing the need to take urgent action before it’s too late, the Australian Parliament gathered Monday to discuss the nation’s dwindling Hemsworth reserves. “Over the last decade, our nation’s crucial Hemsworth supply has decreased to the point of being nearly depleted,” said The Honorable Stephen Perry, President of the Senate, adding that Australia could not afford to squander its most precious resource and must preserve what little was left for the sake of its children and grandchildren. “I fear we are reaching a precipice from which there is no turning back. We all saw what happened to Sweden’s Skarsgård reserves and what a disaster that was—if we don’t learn from history, the consequences for our nation will be dire indeed.” At press time, the Parliament had voted to freeze all Hemsworth exports, as it might take a generation for the supply to be replenished.